A woman in Taiwan has just contracted the H6N1 bird flu — a strain that scientists thought could not infect people. It now joins H5N1 and H7H9 on the list of viruses most likely to make life miserable for humanity. So here's what we know: Back in May, a 20-year-old woman, who was complaining about shortness of breath, was hospitalized with a lung infection. She was released after being treated with Tamiflu and antibiotics. But after sending one of her throat swabs to the Taiwan Centers for Disease Control, scientists identified it as the H6N1 bird flu, a known strain that's circulating widely in chickens on the island. The unidentified patient works in a deli and had no known connection to the birds; investigators aren't sure how she was infected. That said, several family members and friends developed flu-like symptoms after spending time with her, though none of them tested positive for H6N1. 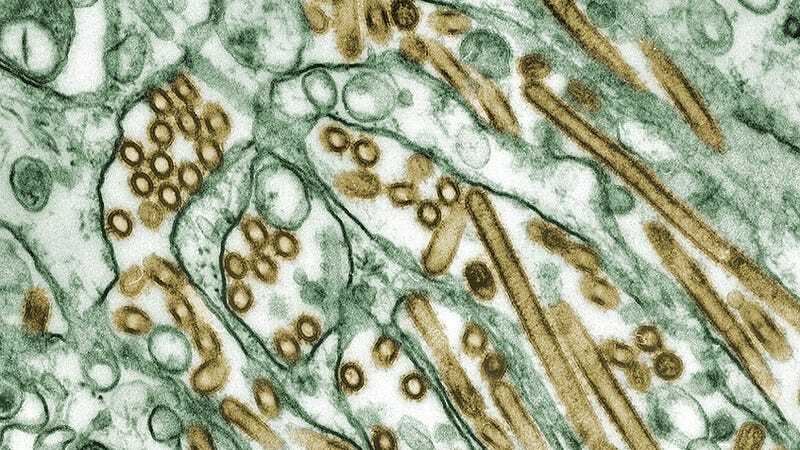 The researchers, who published their findings online in the journal Lancet Respiratory Medicine, say it's the first report of human infection with a wild avian influenza A H6N1 virus. "These viruses continue to evolve and accumulate changes, increasing the potential risk of human-to-human transmission," write the authors. "Our report highlights the continuous need for preparedness for a pandemic of unpredictable and complex avian influenza."